Acadian Genealogy Homepage; Newspaper article on Genealogy and Yvon Cyr, published in Grand Falls, N.B. Grand Falls, N.B. "Getting to the Root of the Matter"
What's in a name? Shakespeare may have been on to something with his famous quote from the play Romeo & Juliet. In this case, their family names kept the star-crossed lovers from each other, but today's couples are finding that their names may be a key to unlocking their past. Studies show that genealogy has exploded in popularity around the world, with the Internet playing a large part. While many embrace the idea of the global community brought about by the electronic age, there is a backswing of people wanting to learn more about their own cultures and backgrounds-- what makes them different from everyone else. Young and old are seeking ties with their roots, and the Internet is making it easier than ever before. Combine that with the resources of affluent Baby Boomers with more time on their hands, and a trend is born. Researching family trees has become the second most popular use of the Internet. The ability to make old, difficult-to-find records available to genealogists on-line has great appeal, making it easier to uncover facts that may remain hidden otherwise. Such instant communication can drastically reduce the amount of time it takes to learn about ancestors and the times in which they lived. And more pertinent documents are coming on-line daily. The Grand Falls Genealogy Club is one of many such organizations being formed in light of this growing interest. The fledging group brings together the talents and research of people from all around the Grand Falls region. Part detectives, part historians, part sociologists-- the members relish the hunt for information that unites them. "Once you start, you want to know more and more. You don't want to stop. And we're getting more and more people all the time," said Anne Cote, one of the many who have been bitten by the genealogy bug. She and others who have been caught up in the lure of the hunt described as "a drug"-- an addictive euphoric drug at that. Why else would otherwise sane people be willing to spend much of their free time poring over dusty tomes long forgotten in a library basement, or scrambling around burial grounds attempting to decipher faint etchings on half-buried grave markers? Notebooks, rubbings from tombstones, and newspaper clippings, jostle for space on many of their desks as they seek just one more fact that they are sure will tie their findings together. She and her fellow members are an eclectic bunch, from all backgrounds. Some have been in the game for many years, with the books, charts and records to show for it. Other are only getting started. Whatever their level of research, the club welcomes all who are looking for some help in finding out where they came from. More than 15 people have signed up since the club was born out of a genealogy workshop last Fall. "There's is a lot of material out there. You just have to know where to look," Cote said. She observed that most people are more than happy to share their findings with others, and to offer pointers for those who don't know where to start. Often, the first clue is to set down the names of immediate relatives, they'll point out. Brothers, sisters, parents, aunts, uncles, cousins-- they all can provide valuable information that can set the beginning genealogist on the right path to earlier generations. Since many families traditionally name children after favorite relatives, a person's moniker may prove a valuable clue. Yet, researchers have quickly learned that those who pursue their hunt for any time, human error can mean frustrating detours and delays. Hunches, as often as scientific research, can often get a person around obstacles such as incomplete records, barely literate scribes, name changes, and disasters such as fires which can wipe out vast amounts of data. Cote reflected on just one such case she has encountered in her own hunt. She ran across an entry listing an "Idiot" as one person's child. Disturbed at the insensivity of whoever had recorded this, even if the girl had been lacking in mental capabilities, Cote made it her business to find out more about this puzzling entry. Her search uncovered the fact that the woman's real name was "Edyth". She surmises that to the ear of an English-speaking clerk, the French pronunciation of the name may have registered as "Idiot" and was recorded as such. "These are the kinds of things you run into," she said with a smile. Besides collecting names and dates, Cote really enjoys learning more about the times her ancestors lived. 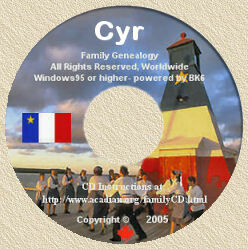 She has discovered that her family tree includes three of the approximately 775 women brought over to New France (now Quebec) between 1663 and 1673. Known as Les Filles du Roi, or King's Daughters, these were girls and women facing bleak futures in their native France. At the same time, King Louis XIV, better known as "The Sun King," was trying to increase the population of the new territory. By shipping out orphans, widows or girls coming from large families incapable of supporting them , the King was able to provide more opportunity for the women, plus satisfying the demands for female company from the colonists and soldiers stationed there. The resulting children provided the desired increase in the population, and the men were more inclined to stick around and defend their King's interest. "The men would be lined-up at the docks when they got there, to look them over and choose. It was a very hard life. I often wonder about the things that women had to put up with," she said. There is mute testimony to the hardships of colonial life in many family trees. Birth dates separated by mere months or a few years speak loudly of the high mortality rate for children. Disease, illness and accidents claimed hundreds before they reached maturity, leading many couples to have large families. Big families also provided the necessary labour to keep a farm running and insure that the parents would have someone to provide for them in their old age. Of further interest to local genealogists is the growing collection of books and material available through the Grand Falls Public Library. The club meets there at 6:30 PM on the second Tuesday of each month. Special excursions are organized according to demand and members' schedules. "A large donation from the late Albenie Lajoie has been a big help to the local cause," Cote said. "He had donated his own extensive genealogy records and a cabinet in which to store them, to the library. This has provided a foundation for the steadily increasing collection of family data there. Now, the library is looking at acquiring works such as a copy of Stephen A. White's two-volume "Dictionnaire genealogique des familles acadiennes" which spans from 1636 to 1714. This should be available at the library this summer", she noted. "We also want the public's help in getting more information," she said. "Those with records that they would like to share with others, can drop them off at the library. Obituaries are of especial interest. Even a photocopy of the information is welcome if the holder would prefer to hang on to the original," Cote said. "I have over 500 obituaries now," she said, saying that she would like to see this collection expand. She suggested another web site of interest may be http://www.genforum.genealogy.com/-------- where the researcher can enter the family name he or she is inquiring about, after the last slash for more information. Click Here to view a Power Point Presentation of the devastation! A Grand Falls, New Brunswick World Record! Another Grand Falls Record. World's Biggest Igloo in Grand Falls, N.B. ... which looked beautiful at night. Campfire in the background. Another Grand Falls, New Brunswick World Record!